Southfield Reservoir in Doncaster is the polar extreme to many of the commercial stillwaters that you find up and down the country – which to many anglers will make it very appealing. This is not your average 12m wide snake lake full of carp, this is a huge water that is packed with shoals of bream. The venue is popular with match anglers, so before you plan a session please check locally to ensure that you will be able to fish when and where you want to. Southfield Reservoir is a venue that favours people with a good level of confidence and patience, don’t be too alarmed if you spend a few fish-less hours on the bank. The fish may take a while to turn up but eventually they should, many a match has been won in the last hour. 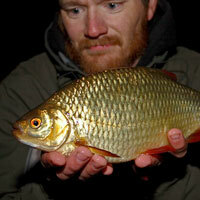 Be careful not to bump any bream off, it may spook the shoal and then it could be game over. Tactics and equipment wise, this venue is normally an out an out distance feeder game. Pack some rods that are capable of launching out a groundbait feeder 60+ yards! If your arms get tired you might have to stand on your seat box in order to hit the required distance. The best pegs on the reservoir could be very much determined by the wind. The fish will follow the direction of the wind, so if you want to catch more you better get ready for a face full of wind! A day ticket session at Southfield Reservoir is priced at £3.50 – these are available on the bank. The water belongs to the Doncaster & District Angling Association, a years membership is priced at £22 or £17.50 for concessions. Address: Oak Lane, Cowick, Doncaster, South Yorkshire, DN14 9AB.